UPDATE: Looks like LSU's coaches saw this video and have been reading my site. They fared far better than Georgia and the ACC. Auburn, AL. Well-respected, staunch, defensive minded head coach hires "innovative" "spread guru" as offensive coordinator. Good news? There are a few differences here between what Franklin and Tuberville tried to do (or said they were trying to do). The biggest, I'd say, is that Malzahn's spread is not exactly like other spreads, whether pass-first ones like the Airraid or run-heavy spreads like Urban Meyer's or Rich Rodriguez's. That's because the schemes are simple - very, very simple - and the core of the offense is not even about schemes: it's about tempo. Mike Leach runs a type of spread no-huddle, but his offense moseys to the line with the confidence and deliberate swagger of an old cowboy (or pirate?). They line-up and get a handle on what the defense is doing, call a play, and go. Franklin used the no-huddle (at least until he got to Auburn! ), and even had a form of it called "NASCAR" which was intended to be an up-tempo light-speed level no-huddle, with the ball snapped quickly after the previous play. But nobody does what Malzahn does. 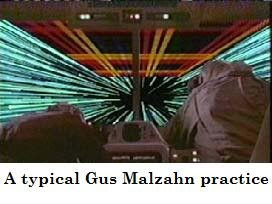 If some no-huddle teams, like Franklin's, are light-speed, then Malzahn's spends the entire game in something akin to "ludicrous speed." The key to his offense is to get the play in with via hand signal, wristband (rarely), or a board on the sideline, and have the ball snapped within four to five seconds of it being set. He even has a speed designed to snap the ball as soon as the whistle blows. It requires endurance and discipline. Is Chizik Trying to Copy Oklahoma? So, you can see why this might be appealing to Auburn, even with a defensive minded head coach. As Dr Saturday recently pointed out, "only Oklahoma's 1,036 total plays bested the Hurricane's 1,007 this year, though TU led the nation in yards per play." I think this is no coincidence. Oklahoma too has a fairly basic system as far as schemes go. They don't do anything that a lot of teams don't. Their passing game is kind of a derivative of what they did under Mike Leach and Mark Mangino, but they have gotten away from the pure faith of the Airraid and now use a lot of rather traditional (meaning, common) concepts. Labeling them spread, pro, multiple, or whatever is a bit futile. (When asked what offense Oklahoma runs, Bob Stoops said simply: "The Oklahoma offense."). They use both the "I" and other traditional sets, though are probably still more "spread" than anything else. But before people jump down my throat, I note that I think Wittgenstein was accurate when he said most arguments boil down to people's different uses of labels and language, in this case what spread or pro means to one person versus another. Kevin Wilson, OU's offensive coordinator, is not known as a passing guru, and few would confuse him with one. But he knows one thing extraordinarily well: the no-huddle up-tempo offense. He ran it at Northwestern with Randy Walker, and that's how OU killed people this year. They have all these great athletes, they have solid schemes, and they go so fast they mow you down. I have to think Chizik envisions this kind of result. Chizik spent the last few years getting his lunch stolen on a weekly basis in the Big 12, and he got destroyed by nouveau spread teams like Texas Tech, Oklahoma State, and Missouri, though he kept it close versus OU. I have to imagine that Chizik, like Stoops when he arrived at OU, wants to take some of those tough offenses he faced with him. And what better model to follow than Stoops? Both he and Pete Carroll have had national success as defensive coaches-to-head coaches by installing aggressive offenses. The other side of Malzahn's attack, apart from the no-huddle aspect (I can't emphasize enough how unique it is to base your offensive philosophy around a tempo rather than simply schemes), is that Malzahn wants to formation you to death. 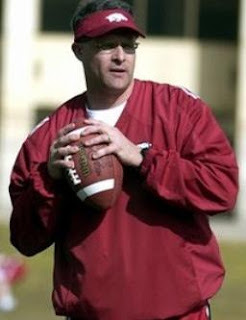 The infamous "wildcat" or "wildhog" offense was developed while Malzahn was at Arkansas, though definitely with input from Houston Nutt and then-QB coach David Lee (now with the Miami Dolphins). See below for an ESPN video about the Wildcat with a brief interview with Malzahn. But Malzahn is less spread and formation to run than he is infatuated with angles and geometry: he passes to set up the run, he uses a lot of shotgun, multiple receivers, and he does a lot of innovative things with wing-backs, tight-ends, fullbacks, and with guys in motion to get any advantage he can. In this way his offense has advantages over what Franklin was doing at Auburn. If done correctly, the tempo and formations really are what eats the defense up. The schemes themselves are simple. Franklin had trouble getting his offense going because he did not have a solid trigger-man who could make his reads and likely lacked the coaching support to get one ready. Malzahn - at least for a time - should be able to mask some of those deficiencies while his players get up to speed through his tempo and formationing, and then from there just give them simple assignments. Now they will still have to learn all the signals and motions and the like, but this is (usually) easier because that just requires a kid to learn what he has to do rather than constantly react to the defense. Thus Malzahn's offense is kind of the anti-run-and-shoot, which uses only a few formations but many reads after the snap. The downside of the offense tends to be turnovers and defense. In Malzahn's first year at Tulsa, they led the nation in yards per game and were in the bottom eight or so in total defense. This year, Tulsa was second in the country in total yards (to Houston) and scoring (to Oklahoma) but ranked in the 80s in total defense. Now, you can make the fair point that if not for the Malzahn-experience, their defense would be just as bad but the offense would be on par as well; neither the conference, talent, nor team would make you expect Tulsa to have a good defense. So, you always have to fear the familiar story: defensive coaches often just do not like the high-risk-high-return offenses, and sometimes mere variance can be confused with incompetence or an actual problem (as it was with Gilbride's 'shoot and Ryan). But it's also true that offensive guys can be a bit narrow minded at times, losing sight of the bigger picture in an effort to score points and rack up yards. Remember the lessons of Hal Mumme. Not too much to say here. In many ways Malzahn's run game resembles Urban Meyer's: Malzahn's is based on four-run plays - the inside zone, the outside zone, the counter, and power - with reverses, fakes, QB runs, and jet sweeps and play-action all built off those four plays. He also throws in some quick traps and draws for good measure. Again, nothing revolutionary. He will play with formations, shifts, and motions. He likes wing-backs. He will line up with the quarterback in the shotgun and put both runners next to him as a sort of offset I-formation. He will use receivers in the running game. And his quarterbacks don't run like Tebow but he runs some option and they are always a threat on the reads and counters. The passing game is equally simple. Unlike the Airraid, which is based off of a lot of horizontal type routes (crossing routes, quick flats and the like), most of Malzahn's routes are "vertical" stems. Think of a passing tree: the receiver bursts off the line upfield to get the defensive guys moving, and from there can go deep, break inside, outside, curl or hitch up, or do a variety of things. He likes deep square-in routes, seam routes, and of course, he runs plenty of smash. The rumor is that Malzahn got his passing game from Evangel Christian, which is similarly based on simple vertical stems to the routes and quick break-offs by the receivers. But, in the end, it is the tempo that defines Malzahn's ludicrous-speed-Space-Balls offense. Time will tell both if he gets to run it (Franklin never got to install his up-tempo NASCAR, and Arkansas did not focus on up-tempo no-huddle while Malzahn was there under Houston Nutt), and, if he does install it, if it works. Note: I am much indebted to the always great Coach Huey football coaching site as I did extra research on this article, as with Malzahn's various resources and of course his no-huddle book. I originally wrote this as part of my lengthy (lengthy!) piece on the A-11 offense, but I think it probably got buried. This is something that I depart from many football coaches and purists about. Despite the fact that I have beef with the A-11 offense, one of those contentions is unequivocally not that it is not real football. That's a bogus reason. I have stated many times that football is just a game, and all its rules are arbitrary. I call those who believe otherwise the Platonic Idealists. Below is a reprint of what I previously stated about the offense. [There exists the argument that some offenses are not "real" or "true" football and therefore is bad.] Yet, haven’t we heard this charge before? Yes we have: The spread isn’t real or true football and therefore it is bad. And the run and shoot isn’t real or true football and therefore it is bad. And the West Coast Offense isn’t real or true football and therefore it is bad. And the wishbone isn’t real or true football and therefore it is bad. At one time the argument was that the entire T formation with a quarterback behind the center wasn’t real or true football and therefore it was bad! 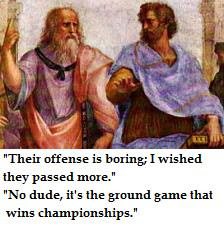 [I]s there some pure, true, Platonic-ideal football? If not, then why? The answer is [no] because football is a game; all the rules - except ones designed around safety - are arbitrary. They might have in mind competitive balance, but this doesn’t make it “true” or “real” in any meaningful sense. What are the most fundamental, “true,” important, or essential rules in football that you can think of? For me, short of the shape of the ball used, my tops would probably be the 100-yard football field, the limit on both sides to eleven players on the field, and the limit on offenses to four downs to score or get a first down. Certainly, all would rank higher than the number of players who might possibly be eligible to receive a forward pass pre-snap, which logically must also rank lower than the number of actually eligible receivers. Yet, setting aside eight-man football, flag-football, and Arena football, look at Canadian football: the field is 110 yards long, each side has twelve players with six – aside from the quarterback – who are eligible to receive forward passes, and the offense has only three downs to work with. Now, if the line of scrimmage was abolished and instead of scoring touchdowns by carrying an oblong ball into the end zone teams were instead required to either kick a round ball into a net or by to throw a round ball through a hoop aligned ten feet above the ground then the game could no longer be called football simply because we wouldn’t be able to recognize it as such. But obviously the ability to recognize the sport as football is something far looser than what the “true football” ideologues advocate as eight-man football and Arena Football, to say nothing of the spread, the wishbone, the West Coast Offense, or even, yes, the A-11 offense, are clearly recognizable as football. So, again, there simply is no such thing as “real” or “true” Platonic football. 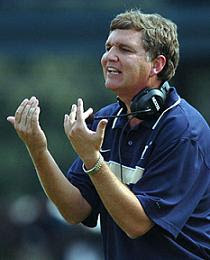 The next time someone next to you says, upon seeing someone successfully employ a double-reverse pass or some next-wave offensive system, that what you just saw was not “real” football (this group includes many football coaches) you can safely think to yourself that this person has no idea what they are talking about, and you can decide for yourself whether to let them know it (if it’s your Boss or Father-in-Law, I suggest agreeing or simply staying mute). Football is a game designed for fun and its rules are designed for no other reason than to promote fun and safety for players and spectators. This view is buttressed by the fact that the primary reason for a sport’s rules is tradition, and nowadays most sports, including football, have ruling bodies that establish the law of the land and continually adjust those rules. If there was Platonic-Ideal "true” football, then the believer would have to view these rulemaking bodies as either improperly tampering with the immortal or, somewhat more likely, that they were continuously tinkering with football in its current form to achieve in this world something more closely resembling true, idyllic football through a process that would have to be described less as rule making and instead as divination. Both are, of course, ridiculous, just as the base claim that there is such a thing as Platonic “true” football is ridiculous. I certainly don’t imagine that this is what such rule makers actually see themselves as doing, but if you accept the “true football” argument, those are your inescapable conclusions. "We don't have our whole system in yet," Johnson said Monday at the Chick-fil-A coaches luncheon. "We'll use the extra practices to work on some of our run-and-shoot stuff. "There are a lot of the areas of the offense that we are still not very adept at," he added. "We've got to improve in the passing game. We've got some work to do in all areas there and this will give us that opportunity." That's enough to make every offensive minded guy salivate. Johnson's vaunted flexbone plus the run and shoot? Like pizza and beer, these two things sound perfect together. But of course things aren't always so rosy. Both the flexbone-triple option and the run and shoot are practice intensive offenses, and I don't think we should expect Georgia Tech to open up and throw for 400 yards when they play LSU. But this isn't a bolt out of the blue; Johnson's been around the 'shoot for a long time and its principles have long been a part of his offense. Indeed, back in the day Johnson was offensive coordinator for a Navy team that upset Cal in a bowl game by racking up 646 yards, including 395 from the air (and they even used a three-receiver stack formation while doing it). And if you go back and study Johnson's offenses you'll see some of the major run and shoot concepts. As I said though, don't expect Georgia Tech to turn all chuck 'n duck. But what can we expect? I expect to see two trusty run and shoot concepts in particular to make a fairly prominent appearance: the Switch and the Go. I have described the "Switch" previously, though there's always different flavors in how you do it. The concept is, at core, a two man concept. Two receivers release and "switch": The outside guys angle inside for 5-6 yards before pushing vertical, while the inside guy runs a "wheel route" under the outside guy, rubs right off of his hip, and then turns up the sideline. That's when they play gets interesting. In the original R&S, each receiver had [several] delineated options depending on what coverage he saw. They could break it quick on slants, run vertical routes, post routes, curls or in-cuts. When it worked it was beautiful. But sometimes, to borrow Yeats's phrase, "things fall apart." Or simply it took immense practice time for receivers to get good at running the play. In my previous post I discussed how some modern teams have adapted and simplified the reads. Expect something along those lines in Johnson's aproach, though he still gives his receivers freedom to find the open spots. Remember, option football is a mentality, and it applies to passing as well as running. The other play, the "Go," is another classic. It is a "trips" route where the outside guy runs a go route or take-off vertical, the middle receiver (usually the guy in motion) runs a "middle-read" or "seam-read" that divides the middle of the field, and the inside guy in trips runs a little flat route after jabbing inside. The play works on a few levels: first, you often get the flat route guy open on a rub off the seam-read receiver's hip; and second the go, backside go, and seam-read often divide up the deep middle coverage to create open spaces for big plays. The thought process is to keep throwing that flat route until they come up for it and then hit them with a big play, either down the sideline or in the seams. But, if you want someone to explain how the "Go" works, then why not ask June Jones? Two notes. First, observe that Davie in the video says that the two toughest offenses to depend are the 'shoot and the wishbone, and further note that the flexbone is merely a form of the wishbone. Johnson knows what he's doing. Also I just want to point out that the only real differences between what Johnson would do with the "Go" and what June Jones would do would be: (a) the slots would be tight-slots rather than slot-receivers; (b) the quarterback would be under center rather than in shotgun (thus actually making the quarterback more of a running-threat when he looks at the flat route as with the original shoot); and (c) the reads for the slot-receiver may - or may not be - somewhat simplified. That really depends on the slot receiver and quarterback. Johnson is not beyond giving them full-freedom, though he can't emphasize it every day in practice like pass-happy June Jones does and still be able to execute his option attack. Like everything else in football, it's a balance. Update: I want to note that I made a correction to the above: it was actually Navy that upset Cal in that bowl game (which happened to take place in Hawai'i). Though Johnson was OC at Hawai'i at one time as well. 2. Why Oh Why Can't We Get a Better [Football] Press Corps? In Bill Walsh's amazing book, Finding the Winning Edge, he had some really insightful points about injuries. Namely, that different positions can handle injuries different. Walsh observed that offensive and defensive linemen tend to be able to play through certain injuries with greater ease, than, say, a defensive back. For instance, imagine if two players have a gimpy or somewhat sprained ankle. The offensive guard, though it is by no means easy, can play through it. But would you really want your press-man cornerback to play with a sprained ankle? One bad step or slow recovery and it's a touchdown. The injury is far more debilitating. Walsh made the same point regarding receivers: they have difficulty playing through injuries for the same reason that a track sprinter would. Quarterbacks provide a good example, in that they can play through a lot of injuries but certain injuries -- to the shoulder, hand, etc -- are debilitating and can often render a QB inoperable. Runningbacks are a unique case. It often depends on the type of runner and the type of injury. An injury affecting explosiveness is significant no matter what; other bruises and various other problems might not have as much of an affect. Even hand injuries can depend on the type of running back -- is he a prominent receiver out of the backfield? But, alas, not a mention of this. Just "this guy is tough" and "that guy spends a lot of time in the tub." 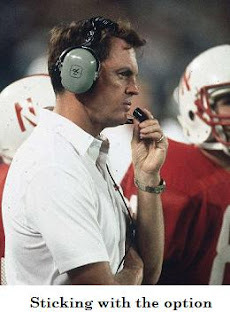 Tom Osborne recently opined on the state of football offenses. And keep in mind that, not only did the guy win multiple championships at Nebraska, his offenses also scored points. Indeed, while much has deservedly been made of Oklahoma's terrific multiple pro-style up-tempo offense, in 1995 it was Nebraska who averaged over 52 points a game en route to a title. Including OU this year, only five teams have averaged over fifty points a game for a season since 1945. So Osborne has a unique perspective on football offenses, the spread, and what could be next. “You know, people are really obsessed right now with spread offense,” Osborne said. “And I think there are a lot of real great features about it. But I think you’re going to see a team jump up and do really well at something that’s different. For a long time, Oklahoma had a real advantage because the only time you saw the wishbone was the week you played Oklahoma. It was so different from what you were doing. “That’s something that’s so much different than what anybody’s seeing,” Osborne said. “He’s going to make some waves. He’s taking what they’ve been doing at the service academies for years. And now he’s got bigger linemen. And more speed. Now he can recruit kids he probably wasn’t getting at Navy. A few points. First, Osborne's description of the spread belies some of the ambiguity behind the term -- he likely has not read my most recent piece on it -- and it's obviously a truism that you can no longer get the advantage of being different if you're doing what everyone else is. Second, Osborne is absolutely right that there are huge advantages to be had by running something that your opponents only see once a year. At one time, this was the spread. Now of course, that's no longer the case. That point can't be overemphasized though. Every offensive scheme must be able to do a few things: must have ways to get the ball to your playmakers; must be able to get the ball to different guys when the defense wants to take your best players away; must have schemes and counters that attack the defenses you will see, both in terms of fronts and coverages; and it must be able to do all those things without overwhelming your players with information. Easier said than done. It's an added, but not necessary perk if your opponents are not used to seeing it. And Johnson, at Georgia Tech, has a special perk with his flexbone: normally, if you do something your opponents are not used to seeing, then you too are not overly familiar with it. That is how it was with the early spread teams. Johnson, by contrast, has used his offense for decades and knows all the adjustments and changes. When Georgia Tech ran all over Miami and Georgia, a lot of it came in the second half. Often, it seemed like the defense had two guys defending, say, the pitch guy, or the quarterback, and none on the guy who wound up running for a forty-yard run. The reason for that was because Johnson knows how to vary his blocking and assignments to take away the guy responsible for those players. So when announcers like to say that you play "assignment" football to stop the option that is only partially true. If you do, Johnson figures out who is "assigned" to his guys and blocks them, and then lets the reads take care of themselves. So this is where execution and soundness of an offense meet uniqueness. But my last point is that I'm not sure if Osborne's narrative is exactly right. It's true that, to some extent, football is cyclical. But it's not exactly cyclical. Defenses do not completely forget; with the internet, they absolutely cannot forget: the answers are all out there. The single-wing stuff is back, but it's also different. In the old-old days, the centers who did the shotgun snaps did not really know how to snap the ball with their heads up, so they were ineffective blockers. So now, with the wildcat and other single-wing variants, the center is now an equally effective blocker. But the meta-narrative here is passing. Again, this point can be overstated, as passing was not invented in the last two decades (Joe Namath had a 4,000 yard season with the Jets), but there's clearly been a synthesis. I think that it will be unlikely that teams will be completely unable to throw -- or run -- with consistent success. Now, that does not mean the type of "balance" usually spewed on TV (equal carries, equal yards, etc) as I have well documented that the better approach to balance is a somewhat game-theoretic one. But both Florida's and OU's offenses are examples of ones where they use advanced and time-tested concepts -- spread, play-action, quicks, multiple-formations, etc -- to put maximum pressure on the defense. As a football pragmatist, I think that these types of offenses will continue to set the standard. Unlike Osborne, I think using what once was, alone, will not work, without the added ability to pass or evolve. 2. Malcolm Gladwell's "Quarterback Problem"
The famous (or infamous) Malcolm Gladwell, author of Blink, The Tipping Point, and now Outliers, has a very interesting new essay in the New Yorker. The point of the article is about how we could be better at selecting teachers, because we now know that being a good teacher is all about making a connection with kids (who are not always easy to read) and these are skills not easily taught, evaluated, or identified. To illustrate the problem of identifying good future teachers he uses the problem of identifying successful NFL quarterbacks, focusing on a scout's attempt to evaluate Mizzou's Chase Daniel. But then Shonka [NFL talent scout] began to talk about when he was on the staff of the Philadelphia Eagles, in 1999. Five quarterbacks were taken in the first round of the college draft that year, and each looked as promising as Chase Daniel did now. But only one of them, Donovan McNabb, ended up fulfilling that promise. Of the rest, one descended into mediocrity after a decent start. Two were complete busts, and the last was so awful that after failing out of the N.F.L. he ended up failing out of the Canadian Football League as well. The year before, the same thing happened with Ryan Leaf, who was the Chase Daniel of 1998. The San Diego Chargers made him the second player taken over all in the draft, and gave him an eleven-million-dollar signing bonus. Leaf turned out to be terrible. In 2002, it was Joey Harrington’s turn. Harrington was a golden boy out of the University of Oregon, and the third player taken in the draft. Shonka still can’t get over what happened to him. And, if we focus just on football for now, this is an amazing thing. No position is paid more highly in the NFL than quarterback, and no position is more integral to a team's success. And no position receives more scrutiny. And it's a total crapshoot. The studies have been done, and draft position -- the best marker of what the expectations levels are for a quarterback -- has absolutely no bearing on how successful a quarterback winds up. This is scary. It's scary enough for football -- all that money and time spent on what is basically a futile endeavor -- but, as Gladwell points out, it's scary for society that we have lots of jobs where we don't know how to pick how people will be successful. Now Gladwell's explanation is likely imperfect (he clearly has not read my articles, particularly when he talks about the "spread" that Mizzou runs), though it hits at the general truth: the only way to evaluate how good a quarterback will be in the NFL is to see them play in the NFL. And even then sometimes the light just goes on for certain guys after a period of mediocrity. It's just so hard to say. With baseball, as Moneyball showed, you can model the game to at least tell you a great deal of what you need to know. It's a game largely about hitters and pitchers. We may not know everything, but it gets us far to the end. But football is too complex. Players can't be evaluated solely on statistics. And the traditional scouting method, some kind of gestalt impression where you say "ah he looks good" has been proven unreliable. We know that Peyton Manning and Ryan Leaf were seen as the undoubted 1-2 picks. Many liked Leaf better. We know Leaf completely failed while Manning has had remarkable success. Do we even know why, exactly though? A fair but unscientific pop psychology hypothesis is that Leaf was too mentally unstable: he had all the physical tools but few of the emotional and mental ones. But isn't it obvious that NFL quarterback is only a partially physical game? I always thought of evaluating quarterbacks as a threshold approach: the guy has to be able to do certain things, to make certain throws, but after that, the physical qualities diminish. Whether a guy throws a deep out with "zip" or as a "laser" is irrelevant if he lacks knowledge, awareness, and a sense of timing. And do we even know if that hypothesis was right? What about those five guys from 1999? How do you explain Akili Smith and Cade McNown who were apparently dead on arrival? Tim Couch seemed to just fumble through mediocrity into eventual oblivion, but those two guys were right there and had unbelievably short careers. Physical? Mental? Mental in what sense? Couldn't learn the playbook? Couldn't handle the pressure? No timing? No support from teammates? I haven't a clue. I don't know how you glean lessons from those evaluation failures. A college quarterback joining the N.F.L., by contrast, has to learn to play an entirely new game. Shonka began to talk about Tim Couch, the quarterback taken first in that legendary draft of 1999. Couch set every record imaginable in his years at the University of Kentucky. “They used to put five garbage cans on the field,” Shonka recalled, shaking his head, “and Couch would stand there and throw and just drop the ball into every one.” But Couch was a flop in the pros. It wasn’t that professional quarterbacks didn’t need to be accurate. It was that the kind of accuracy required to do the job well could be measured only in a real N.F.L. game. Similarly, all quarterbacks drafted into the pros are required to take an I.Q. test—the Wonderlic Personnel Test. The theory behind the test is that the pro game is so much more cognitively demanding than the college game that high intelligence should be a good predictor of success. But when the economists David Berri and Rob Simmons analyzed the scores—which are routinely leaked to the press—they found that Wonderlic scores are all but useless as predictors. Of the five quarterbacks taken in round one of the 1999 draft, Donovan McNabb, the only one of the five with a shot at the Hall of Fame, had the lowest Wonderlic score. And who else had I.Q. scores in the same range as McNabb? Dan Marino and Terry Bradshaw, two of the greatest quarterbacks ever to play the game. We’re used to dealing with prediction problems by going back and looking for better predictors. We now realize that being a good doctor requires the ability to communicate, listen, and empathize—and so there is increasing pressure on medical schools to pay attention to interpersonal skills as well as to test scores. We can have better physicians if we’re just smarter about how we choose medical-school students. But no one is saying that Dan Shonka is somehow missing some key ingredient in his analysis; that if he were only more perceptive he could predict Chase Daniel’s career trajectory. The problem with picking quarterbacks is that Chase Daniel’s performance can’t be predicted. The job he’s being groomed for is so particular and specialized that there is no way to know who will succeed at it and who won’t. In fact, Berri and Simmons found no connection between where a quarterback was taken in the draft—that is, how highly he was rated on the basis of his college performance—and how well he played in the pros. The entire time that Chase Daniel was on the field against Oklahoma State, his backup, Chase Patton, stood on the sidelines, watching. Patton didn’t play a single down. In his four years at Missouri, up to that point, he had thrown a total of twenty-six passes. And yet there were people in Shonka’s world who thought that Patton would end up as a better professional quarterback than Daniel. The week of the Oklahoma State game, the national sports magazine ESPN even put the two players on its cover, with the title “CHASE DANIEL MIGHT WIN THE HEISMAN”—referring to the trophy given to college football’s best player. “HIS BACKUP COULD WIN THE SUPER BOWL.” Why did everyone like Patton so much? It wasn’t clear. Maybe he looked good in practice. Maybe it was because this season in the N.F.L. a quarterback who had also never started in a single college game is playing superbly for the New England Patriots. It sounds absurd to put an athlete on the cover of a magazine for no particular reason. But perhaps that’s just the quarterback problem taken to an extreme. If college performance doesn’t tell us anything, why shouldn’t we value someone who hasn’t had the chance to play as highly as someone who plays as well as anyone in the land? One answer is that ESPN the magazine is a hyperbolic and bizarre magazine, but there were actual scouts quoted in that article. The view seemed to be that while Chase Patton is not good enough to beat out Chase Daniel, he is instead good enough to be drafted ahead of him. In any event, this is a problem that affects all professions, and all stages of life. We know that what makes someone good in one level cannot be evaluated until you get to the next. Chase Daniel is an excellent college quarterback, and all the debate about the NFL around him is really unfair and beside the point so long as he in college, as it is with Tim Tebow. The answer is no one knows how good these kids will be. It's no referendum on them, nor their spread offenses or coaches, but just different circumstances. Eventually, I suppose, scouting will finally more approximate a science. But right now, we know, that scouts and NFL teams literally do not know what they are doing when they throw money at guys. Matt Ryan and Joe Flacco look excellent, but they just as likely could have been Ryan Leaf or Cade McNown. This year Green Bay drafted Brian Brohm from Louisville early in the draft and Matt Flynn from LSU in the seventh round. Right now, Matt Flynn is ahead of Brohm on the depth chart: he just beat him out in camp and pre-season. No one could have foreseen that until they all got there. Brohm will be fine, but the Packers both were hurt and helped by their own incompetence at evaluating quarterbacks: they seem to have overvalued Brohm and everyone else undervalued Flynn. Midway through the fourth quarter of the Oklahoma State–Missouri game, the Tigers were in trouble. For the first time all year, they were behind late in the game. They needed to score, or they’d lose any chance of a national championship. Daniel took the snap from his center, and planted his feet to pass. His receivers were covered. He began to run. The Oklahoma State defenders closed in on him. He was under pressure, something that rarely happened to him in the spread. Desperate, he heaved the ball downfield, right into the arms of a Cowboy defender. Not much to say about this, except that it is inspiring to a nearly unbelievable degree. Do yourself a favor and watch it.